On Guam, The Mood Is Calm Despite Being In North Korea's Crosshairs : Parallels Despite North Korea's recent threats to create an "enveloping fire," hotels and beaches are full in the tiny U.S. Pacific territory. "If it's gonna happen, it's gonna happen," says one resident. At Mosa's Joint in Guam, island residents and military personnel fill up the bar for Thursday happy hour. The escalating threats between the U.S. and North Korea have thrown the tiny U.S. territory of Guam into the headlines. North Korea this week threatened to create an "enveloping fire" around the strategically important Pacific island, located about 2,100 miles to its southeast. But life here seems to go on as usual. 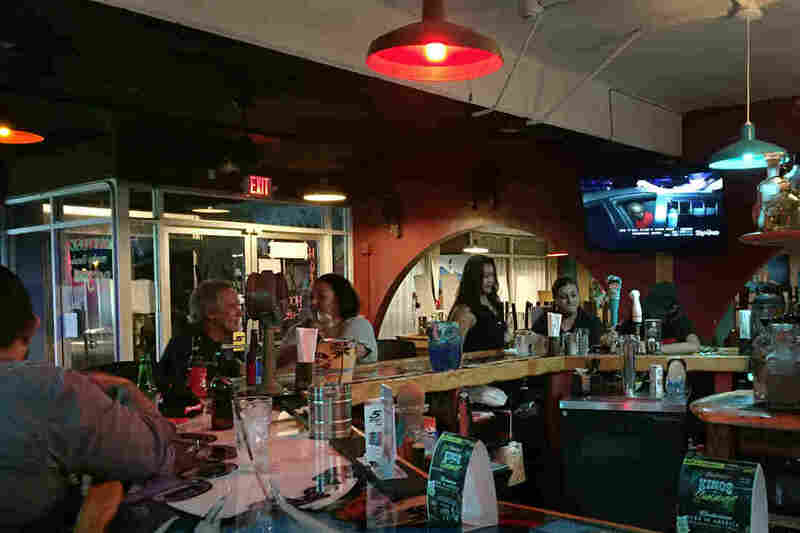 At Mosa's Joint, in Guam's capital Hagatna, Thursday happy hour lasts until 8 p.m. The place fills up fast with locals and military personnel, "kind of a little bit of everything," says Monique Genereux, who opened the bar and restaurant a few years ago. Despite North Korea's threat against Guam this week, she says folks are keeping their cool. "It's a very serious topic for sure, and it can be scary, but you know, if it's gonna happen, it's gonna happen," she says. One of the regulars is Gary Hartz. He plays in a psychedelic blues band every week and is a dean at the local community college. "There are many moods on Guam right now," Hartz says. "Some people [say], 'We just want our peace, our island groove that we've always have.' There are other people who are just sick and tired of the threats from North Korea because there sure have been many over the years. And then there are people who feel like our president has been exacerbating things too." But Hartz says the latest North Korea scare feels more serious than previous ones. "On the North Korean side," he says, "there are differences of specificity." He is right: This time, North Korea has detailed plans for a missile test that would land in the waters near Guam. It noted which weapons it would use (intermediate range ballistic missiles), how many of them (four) — and the timing: sometime before the end of this month. "Those are things that were not known in the past," Hartz says. "Beyond that, we also have a president who has got a more aggressive tenor than other presidents in the past." Locals here remember 2013, when North Korea threatened the Andersen Air Force Base, which hosts the U.S. Pacific Command's bomber fleet. That base and a U.S. naval base are home to about 13,000 American military personnel. Guam, with a 2016 population of almost 163,000, has been fought over for centuries. "Japan invaded us, the Spanish invaded us," Genereux says. "The U.S. came here because I think they wanted the land and they helped us out with the Japanese, because I think they wanted the land. Strategically, it's a perfect spot." But, she concedes, "It definitely makes us a target." Still, a certain island calm prevails amid the tensions between Washington and Pyongyang. Sold-out hotels are full of tourists, and the beaches are full of runners and sunbathers. "I've had a couple customers say that if it happens and we find out we have 10 minutes left, we're gonna come down here and have some drinks with you guys!" says Genereux. Chris Hartig of Guam Public Radio contributed to this story.